Childhood obesity is on the rise, along with risk factors for heart disease. Many children now have to combat Type 2 Diabetes, due to the sedentary lifestyles they have become accustomed to in our modern day era. Keeping Kids Fit will become a great family resource and guideline to assist parents with maintaining a healthy lifestyle for their children. This reference guide gives simple approaches to exercise, nutrition, dieting, sleep, hydration, habits, sports, and much more. "Through my foundation, I work to promote healthy, active lives, especially for children. It’s very important that children are active, and Len Saunders has spent the last 3 decades teaching children how to stay active and healthy." "Getting kids active and keeping them healthy is so important and is more challenging than ever. Len Saunders lays out a plan that can assist all parents in their efforts to help their children discover all that sports and exercise have to offer." "Keeping children active motivates them to be healthy in their adult lives. Len Saunders gives a simple blueprint for success that helps kids keep good habits." Teach your children the proper fundamentals of sports, fitness, and exercise. Learn safe and fun ways to exercise as a family. Gain more insight to proper nutrition and health. Examples of healthy meals and snacks will be included in this book. Suggestions will be given on how to stay healthy as a family, including proper sleep, hydration, and team sport concepts. Len Saunders has been involved in children's health and fitness for over 25 years. He has won awards for his contribution to children's health and fitness at the local, state, and national levels. He has been a guest speaker at universities, as well as state and national conventions. He served as a consultant to The President's Council on Physical Fitness and Sports. as well as a spokesperson on childhood obesity for the American Heart Association. 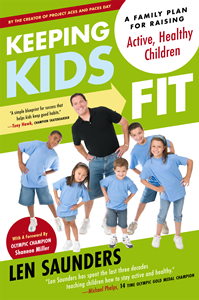 Len's contribution to children's fitness has reached millions of children and their parents. He has contributed articles to Muscle & Fitness, Human Kinetics Publishing, and has written and consulted with Sports Illustrated for Kids magazine. Len's articles have been used as support for nationally syndicated television shows on ABC-TV, and he has appeared on CNN. Len is also the author of The Project ACES Handbook, which was published in 2004.